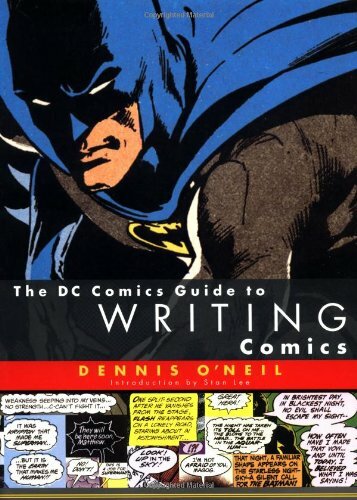 The DC Comics Guide to Writing Comics by Dennis O’Neil. Order your copy now by clicking on the book cover above! (Originally published around 1996.) Is it fair to speak the word “Batman” in the same breath as Hamlet? Bob Kane may have created Batman, but that was 57 years ago — ironically, the same month, May, and year, 1939, O’Neil himself was born. “Enough to make you believe in astrology,” he jokes. For the last 11 years, the caped crusader’s care and feeding has rested with O’Neil. O’Neil knows this character pretty well, too, having written more than 120 of his adventures since 1968. One of the modern deans of his medium, O’Neil wrote the “Bat-bible” which all Bat-writers have followed for the past decade, whether in comics, animation or film. He also authored the comic book adaptation of the upcoming Bat-film, Batman & Robin, due in theaters this summer. O’Neil first spun the character in the months following the cancellation of the ABC “Batman” series in 1968. Since then, Batman and Bruce Wayne’s world has been a dark and tortured place. The Caped Crusader turned completely humorless and bleak in 1993 when a bad guy named Bane broke his back and nearly killed him in a year-long story called “Knightfall.” That incident led to the arrival of a violent new Batman named “Azrael” and an updated costume outlined by sharp edges and an arsenal of high tech new Bat-gadgets, all of which were roundly booed by readers. Denny O’Neil, photograph by Luigi Novi, all rights reserved. O’Neil says that trying out someone other than Bruce Wayne as Batman was a product of the times in which we live. “We wondered if our notion of hero was outmoded,” he says. “Looking at other media, not only comics but popular movies, heroes seemed to be not a whole lot different than the villains in that sometimes the only qualification for heroism that the hero seemed to posses was the ability to commit wholesale slaughter and wisecrack about it. Which is antithetical to my idea of hero. I’ve always thought physical prowess has to be balanced by some kind of soul. But readers hated Azrael in the role. The storyline consumed 1,164 pages by O’Neil’s count — more than a year in real time — before Bruce Wayne once more donned his traditional cowl. That’s why Batman keeps coming back, stronger and ever more intriguing, while his friend Superman struggles through marriage, a ponytail and an electric-blue new costume and powers. “I think Batman attracted more really good talent over the years,” O’Neil says of a perceived creative disparity between the two characters. “Having written both characters, it was that invincible thing that made it difficult for me to handle Superman — both to identify with him and to write dramatic stories. The nature of melodrama is that the hero has to be in really bad trouble once in a while. There must be conflict and conflict implies that he goes against equals. That’s simple, Basic Writing 101. I always found it easier to fulfill those requirements with Batman.